Since its inception in 1971, the Humane Society of Alamance County has helped spay or neuter thousands of companion animals! Through partnerships with local veterinary clinics, we are able to provide our spay and neuter vouchers at a low cost to the community, thereby promoting proper pet health and reducing overpopulation in our county. Our PACKAGE via Animal Hospital of Mebane and Creekside Animal Clinic includes the spay/neuter surgery, rabies vaccine and three days worth of take-home pain medication. Animals over 79 pounds will incur an additional fee of $50.00 to be paid by the owner prior to surgery. Animals weighing over 120 pounds will not be accepted. All pets must be at least six months of age to be sterilized. Our PACKAGE via The Spay and Neuter Clinic of Alamance County includes the pre-surgical exam, rabies vaccines and all pre and post operative pain medication. Animals over 79 pounds will incur an additional fee of $50.00 to be paid by the owner prior to surgery. Animals weighing over 120 pounds will not be accepted. All pets must be at least six months of age to be sterilized. ATTENTION!!! Please be aware that, due to demand, all appointments for the Spay & Neuter Clinic are now being scheduled well into July while all appointments for Animal Hospital of Mebane are now being scheduled well into August. ​​*A FULL REFUND WILL BE AVAILABLE WITHIN 30 DAYS OF VOUCHER PURCHASE ONLY. NO EXCEPTIONS. 1. If your pet has parasites, including fleas, that the vet determines requires treatment. 2. If your pet is in heat or pregnant. 3. If your pet has an undescended testicle (cryptorchidism). 4. If your pet is a senior. 5. If your animal is extra large in size and/or weight. 6. If the veterinary clinic you chose requires the pet to be up to date on other vaccines (not included in the package) prior to surgery. *Extra charges could range from $15-$250 and are NOT covered by HSAC. ​In honor of our Military Veterans and Active Duty Personnel (including National Guard and Reservists) as well as our First Responders (police officers, sheriff deputies, firefighters, paramedics and rescuers), the HSAC is proud to offer a 50% discount on our (regularly priced) spay/neuter packages. Active Duty Personnel: Common Access Card (CAC) or Uniformed Services ID Card. First Responders: Valid State, County or Agency issued ID card with photo. After submitting the form first and completing the payment below, please email a photo of your identification card or badge to hsacinfo@gmail.com. We must have all three items on file in order to schedule your pet's appointment. *PLEASE MAKE SURE TO SUBMIT THE FORM FIRST (ONE FORM PER PET) AND THEN SUBMIT THE PAYPAL PAYMENT BELOW. ​​*A FULL REFUND WILL BE AVAILABLE WITHIN 30 DAYS OF VOUCHER PURCHASE ONLY. NO EXCEPTIONS WILL BE GRANTED. FIRST COMPLETE AND SUBMIT THE FORM BELOW! PLUS PACKAGE via Animal Hospital of Mebane and Creekside Animal Clinic includes the spay/neuter surgery, rabies vaccine and the pre and post operative pain medication. Animals over 79 pounds will incur an additional fee of $50.00 to be paid by the owner prior to surgery. Animals weighing over 120 pounds will not be accepted. All pets must be at least six months of age to be sterilized. Once the voucher has been received, owners must re-confirm the appointment with the clinics directly via phone call. 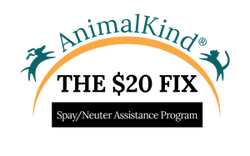 PLUS PACKAGE via The Spay and Neuter Clinic of Alamance County includes the pre-surgical exam, rabies vaccine and the pre and post operative pain medication. Animals over 79 pounds will incur an additional fee of $50.00 to be paid by the owner prior to surgery. Animals weighing over 120 pounds will not be accepted. All pets must be at least six months of age to be sterilized. ​SUBMIT THE APPROPRIATE PAYMENT BELOW! A FULL REFUND WILL BE AVAILABLE WITHIN 30 DAYS OF VOUCHER PURCHASE ONLY. NO EXCEPTIONS WILL BE GRANTED. NO APPOINTMENTS WILL BE MADE UNTIL PAYMENT IS RECEIVED. TO AVOID DELAY AND CONFUSION, PLEASE MAKE SURE THE NAME INCLUDED ON YOUR FORM CORRESPONDS TO THE NAME ON YOUR PAYMENT. If you have any questions, please call us at 336-438-2023. You can learn more about their spay and neuter program "The $20 Fix"
and find out whether or not you qualify by visiting the link below. Click on the link below and visit the ASPCA page to learn all about Spay and Neuter Myths and Facts! Your neutered male will be much better behaved. Neutered cats and dogs focus their attention on their human families. On the other hand, intact dogs and cats may mark their territory by spraying strong-smelling urine all over the house. Many aggression problems can be avoided by early neutering. Spaying or neutering will NOT make your pet fat. Don’t use that old excuse! Lack of exercise and overfeeding will cause your pet to pack on the extra pounds—not spaying and neutering. Your pet will remain fit and trim as long as you continue to provide exercise and monitor food intake. *Information gathered from ASPCA and HSUS websites and publications.